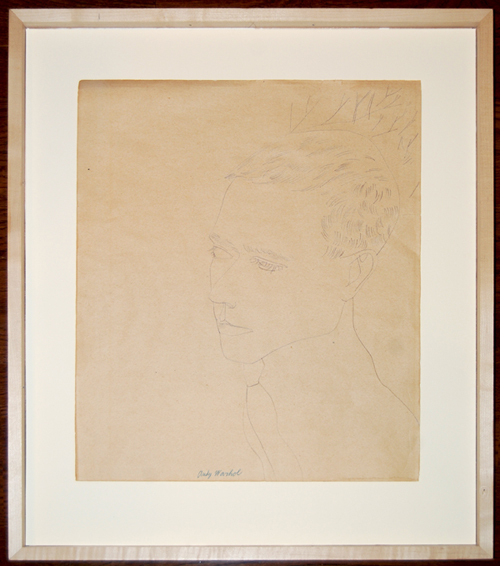 Sent in to the valuation service this summer was a delicate ballpoint drawing by Godfather of Pop Art Andy Warhol. Swann Galleries in Manhattan have consigned the piece for their November Contemporary Art auction. 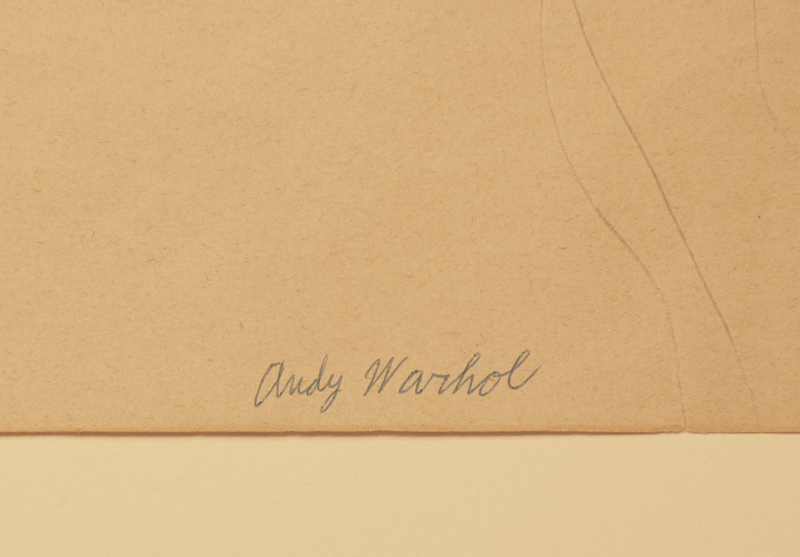 What is particularly significant about this 1956 piece is that it was drawn the same year that New York’s Museum of Modern Art wrote to Warhol rejecting his ‘’Shoe’’ drawing from their collection. 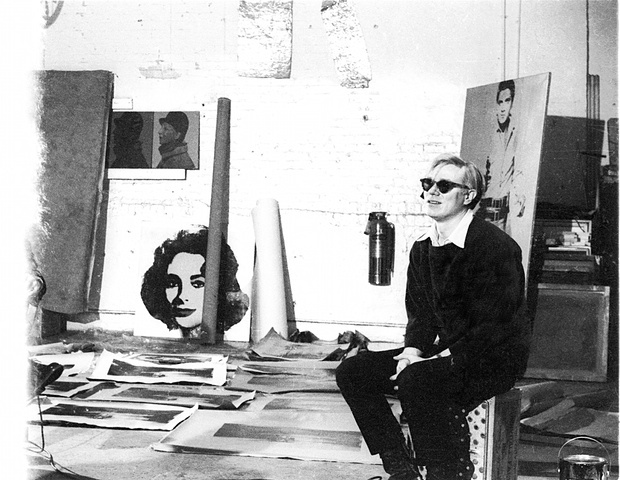 The year was 1956, a 28 year-old Andy Warhol was beginning to gain recognition on the New York art scene thanks to a string of exhibitions in the city. His early career as an artist was focused on commercials, with his first commissions being illustrations of shoes for Glamour magazine and later for shoe designer, Israel Miller. It was one of these whimsical accessories illustrations that Warhol would submit to MoMA for acceptance into its permanent collection. 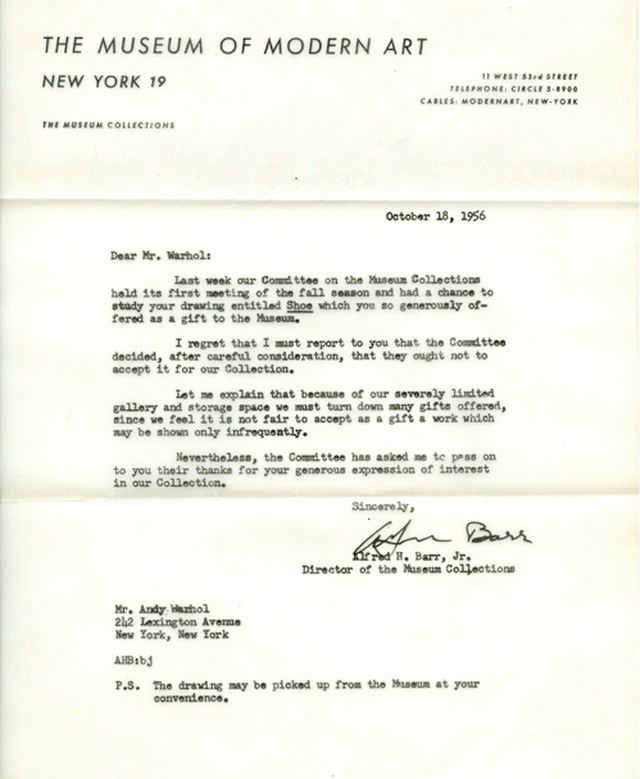 The letter in question, dated Oct. 18, 1956, and addressed to Warhol at 242 Lexington Ave., NY, NY, explains why the collections committee decided to reject the drawing, Shoe, which Warhol offered as a gift. Just to make sure Warhol was clear that his work was not to stay at the MoMA, the letter ends: "P.S. The drawing may be picked up from the Museum at your convenience.” Kudos to MoMA seeing the funny side of their misjudgement and tweeting the letter. 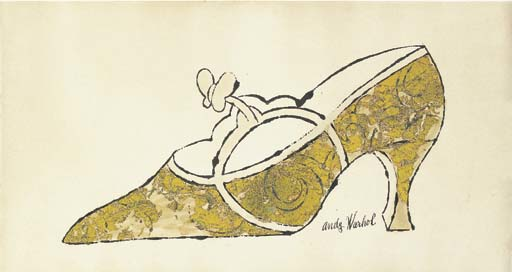 Today, Warhol’s Shoe drawings can fetch tens of thousands of dollars at auction, in 2002 a blotted ink and golden leaf on paper created in 1956 sold for £27 500 at Christie’s. Check out more realised prices for Warhol here. The same year that Warhol's work was rejected by MoMA, the artist was working on other drawings, including a series of ballpoint studies of the male form. The voyeuristic images of men continue throughout Warhol’s oeuvre, as seen in his 1963 film Sleep as well as his photography from 1986. 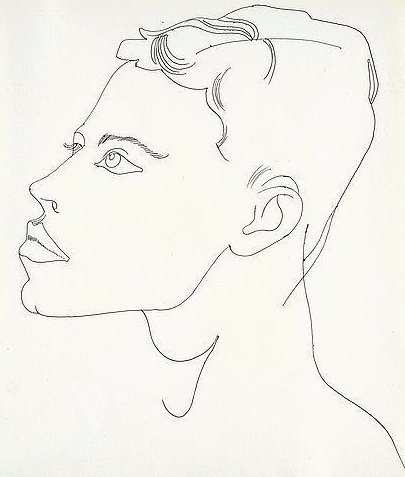 The piece sent in to Barnebys valuation service was one of these early line drawings of young men, some of which were featured in Warhol’s Drawing for a Boy-Book launch and exhibition at New York’s prominent Bodley Gallery in 1956. The extremely intimate pieces draw inspiration from French masters Henri Matisse and Jean Cocteau, reducing the human body to well-placed lines. 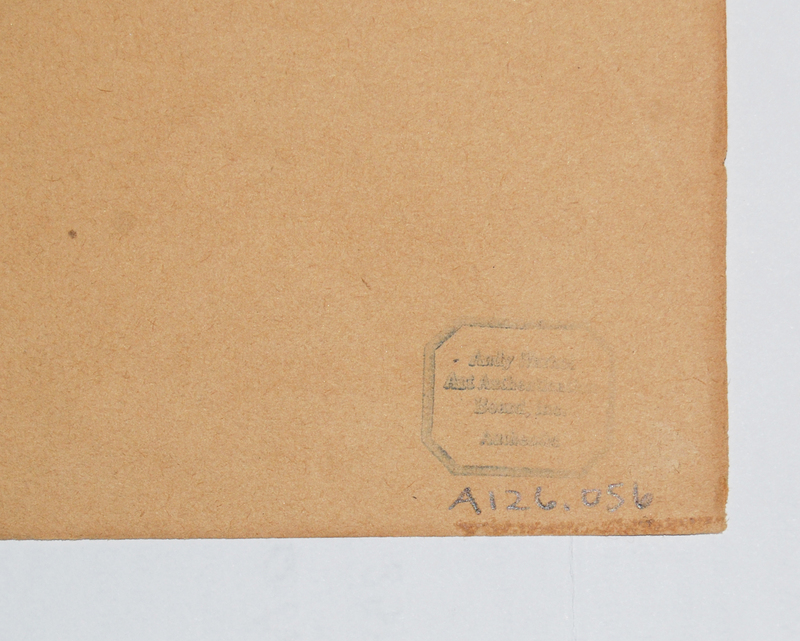 Other works from the series can be seen in important museum collections around the world, including The Tate, London. This year, the Warhol drawing sent in to Barnebys appraisal service will make its way back to New York, 61 years after it was first drawn in the same city, as it hits the auction block at Swann Galleries in May 2018. Swann's experts have provisionally valued the original Warhol could fetch in excess of $10 000 at auction. Think you have something that could be worth a pretty penny? Send it in to Barnebys valuation service by creating an account here. Upload photographs and information on your piece - which can all be done straight from your smartphone. Your piece will then be automatically sent to our team of specialists, who will expertly value the piece and create your personalised valuation certificate. No need to wait - each valuation you submit has a guaranteed response time of 48 hours. Our team of specialists are seasoned auction experts who have accumulated decades of art market experience. Representing over 40 categories, our Valuations Team is able to value the full spectrum of fine and decorative art globally.